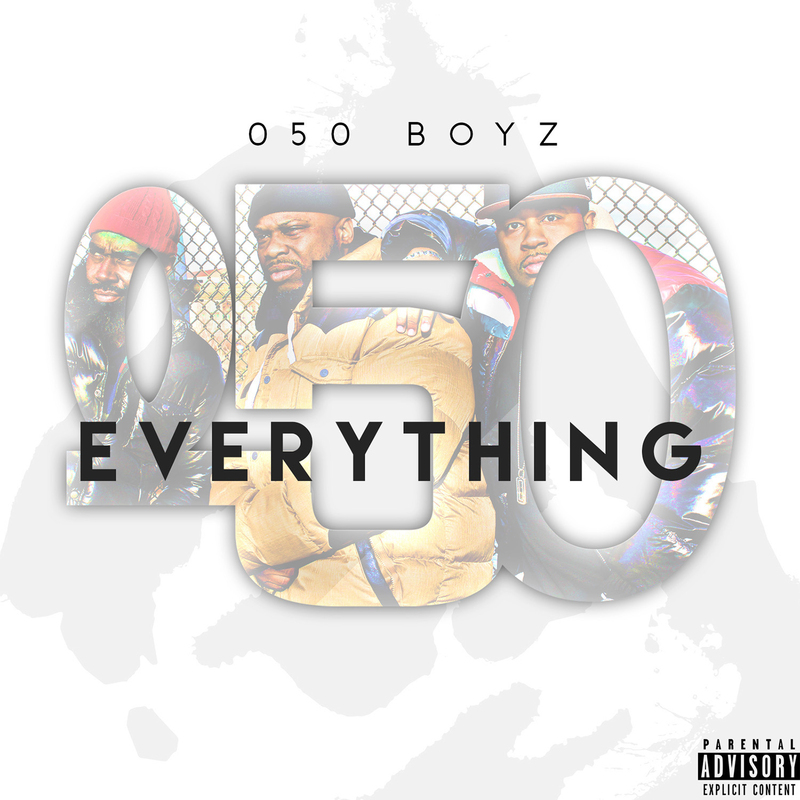 New Jersey’s Prince AK, Riq da Kid & Tru Trilla – aka 050 Boyz – release their debut album “Everything 050” on Tuesday 4th August 2015. Produced entirely by Clinton Place, the Newark trio are joined on the album by many long time local associates including Treach (Naughty by Nature), DoItAll (Lords of the Underground), Tha Advocate, Ib the Druid, Lakim Shabazz, B Wells, Famiil, and there’s also a little UK flavour courtesy of WiseRap. The group recently recorded a new bonus cut “Pay The Bail” and filmed this accompanying video released today. 050 Boyz – Pay The Bail (Official Music Video) from UrbanElite Promotions on Vimeo. They will be guests of DJ Eclipse on his Halftime Show on WNYU (12th August) and again on his Rap Is Outta Control Show on Sirius XM (30th August). Look out for extensive press & media coverage of this release over the coming month during which time the group will be releasing more videos and bonus tracks. Baltimore Emcee M.I. 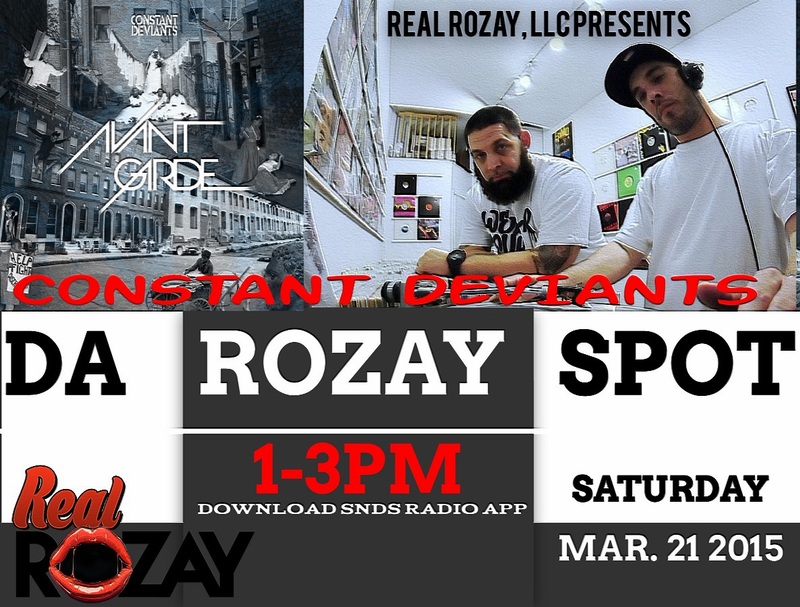 from Constant Deviants is currently in Florida for a short stay, and will be dropping in to Miami’s SNDS Radio studios on Saturday 21st March from 1pm – 3pm EST (5pm – 7pm GMT) to appear live on the station’s Da Rozay Spot Show. Expect to hear M.I. discuss his near 20 years in the industry, both in the Major and independent sectors, and of course the new Constant Deviants album “Avant Garde” which releases on 12th May 2015 on vinyl, CD and digital formats through Six2Six Records. 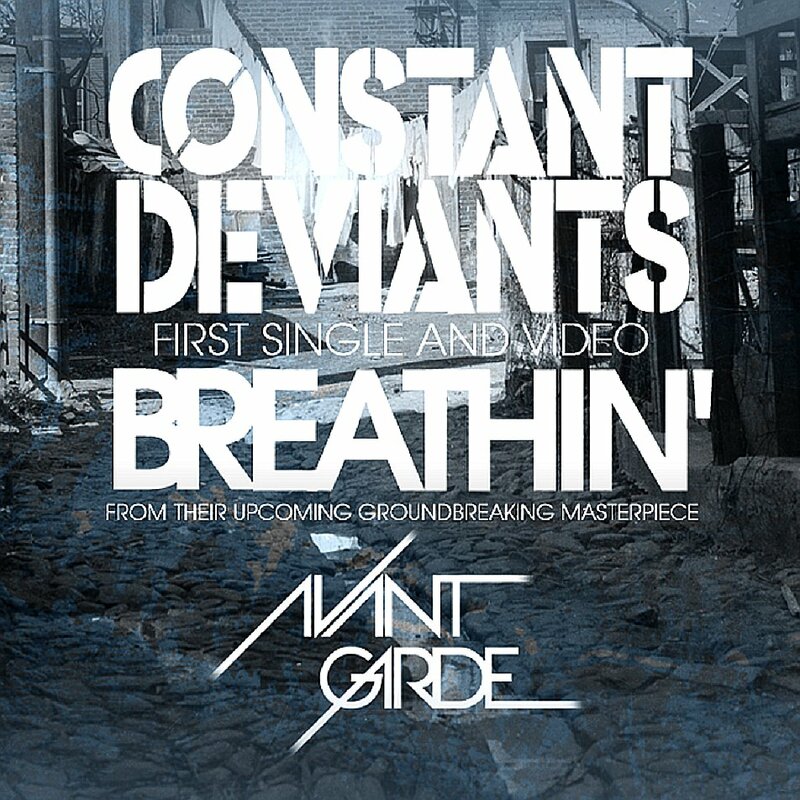 Veteran hip hop duo Constant Deviants release their fourth studio album “Avant Garde” through their own Six2Six Records imprint on 12th May 2015. Producer DJ Cutt and emcee M.I., now based in New Jersey and Baltimore respectively, have today released the second official video taken from the new project. The follow up to “The Right Moment” released late last year, “Breathin” incorporates the classic Constant Deviants sound. A symbiotic mix of Cutt’s jazz and soul sampled beats complimenting M.I.’s smooth flow as he delivers another cerebral masterclass in the art of storytelling. Any dj’s not already serviced with the DJ pack including the full quality clean radio edit mp3 can request it by contacting us at UrbanElite PR HERE Similarly, all press and media inquiries regarding Constant Deviants and the album “Avant Garde”, whether requests for promotional copies of the album to review, or requests to interview the artists can be sent to us via the same point of contact. 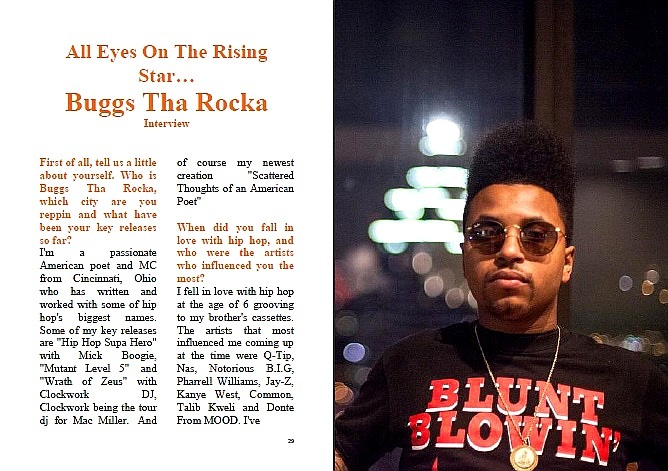 Crowned once again as “Hip Hop Artist of the Year” at last month’s Cincinnati Entertainment Awards, Buggs tha Rocka has just featured in the new issue of France’s “Hip Hop Breathe” magazine. He discusses his latest album “Scattered Thoughts of an American Poet” which released as a free download on 10th December 2014, and includes production by Sal Dali, Hop Trax, !llmind and Jake One with a wide array of featured artists including Tanya Morgan, Chuck Inglish, MOOD, Phoenix Aphrodite and Piakhan. 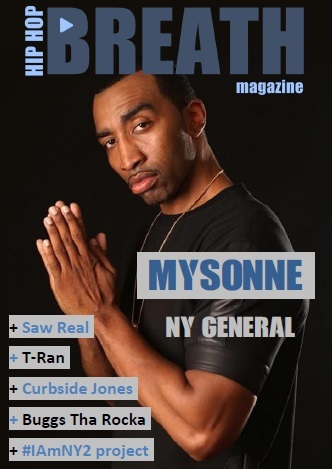 He also speaks on his future plans and the possibility of working with legendary producer Hi Tek, the artists who have influenced him the most over the years and the subject matters and various artistic outlets that inspire him the most. Afforded the title “Hip Hop Artist of 2014” by the Cincinnati Entertainment Awards, the MC spoke with the publication’s Pedro Shippuden about his new album “Scattered Thoughts of an American Poet” which releases on 10th December 2014. 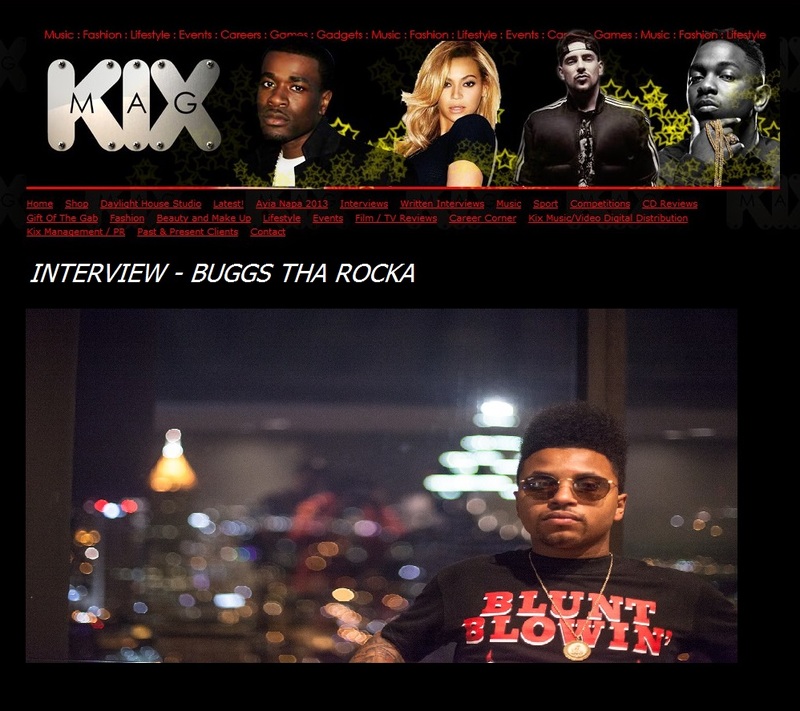 In the past couple of months, Buggs has performed at the A3C Festival in Atlanta with Talib Kweli, the Reflection Eternal reunion show in Cincinnati, opened for Bone Thugs n Harmony and shared the stage with Mac Miller at the Camp Flog Gnaw Carnival in Los Angeles which also featured Tyler the Creator, Earl Sweatshirt, Rick Ross and Pharrell Williams. 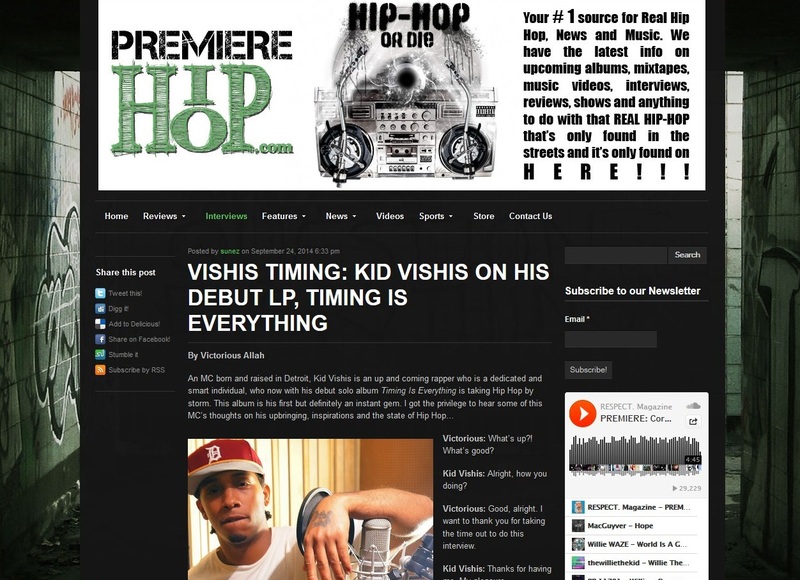 Having already given his full endorsement to the album “Timing is Everything” by Detroit’s Kid Vishis in an earlier review, Premiere Hip Hop’s Victorious Allah sat down with the MC recently to talk about his journey to completing his debut release. Look out for some more media coverage in the UK, Spain and Italy being published shortly, and the release of a brand new track on Monday 29th September featuring Trick Trick, not included on the album, but which will be available for free download as a thanks by Kid Vishis to his fans for the support.